Slice leek and cut lettuce into large pieces. In a large saucepan, sauté the leek in the oil for 5 minutes or until nicely caramelised. Add the vegetable stock and peas and cook for 3-4 minutes. Add the lettuce and simmer for 3-4 minutes. Set aside and allow to cool a little. Blend and season to taste with pepper if desired. Note: to save time during the week, this soup can be made in large batches and frozen or kept in the fridge. 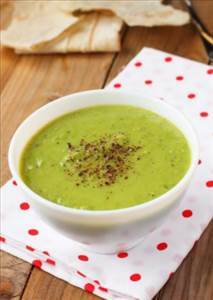 There are 165 calories in 1 serving of Green Soup II. Calorie Breakdown: 13% fat, 70% carbs, 17% prot.